"Everything is a weapon." Awesome. One of our most anticipated upcoming summer comedies due out this August is American Ultra, starring Kristen Stewart and Jesse Eisenberg as stoners in a small town who suddenly end up in a secret government operation. We've already featured a trailer for this and it looks good, but our friends at SlashFilm have posted their recap of a set visit where they watched an action scene at strip mall with everything in it being used as a weapon. 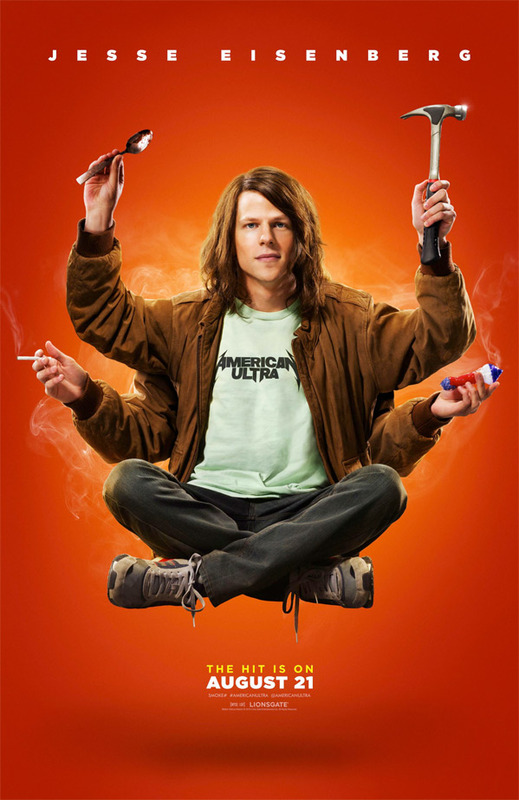 These new posters have Eisenberg and Stewart floating in kind of a Ganesh pose, with extra arms holding things like a weapon, joints, bongs, a spoon, and a hammer. I just think these look cool, nice marketing for a film that sounds like it's going to be crazy fun. A stoner and his girlfriend's sleepy, small-town existence is disrupted when his past comes back to haunt him in the form of a government operation set to wipe him out. American Ultra is directed by filmmaker Nima Nourizadeh, of Warner Bros' smash party hit Project X previously. The screenplay was written by controversial writer/artist/filmmaker Max Landis, who can currently be found on Twitter @Uptomyknees. Nourizadeh tells MTV, "You start with this kind of like sweet love story… I don't want to turn people off with that, but what's really unique about this movie is the fact that it’s like this kind of crazy action-comedy, but really at the core there is this like romance and there's this love story where all he wants to do is to propose to her." Lionsgate will debut American Ultra on August 21st this summer. See the first trailer. Kristen Stewart, looking electrifyingly charismatic as always. That's the dream, just get melted and have the secret knowledge tucked away, writing this stuff must be a piece of cake. Posters are pretty decent. I'm sure this wouldn't offend any Hindus out there. Could've been filmed years ago and just now being released. The posters are cool. Looking forward to this film.